DUBLIN, Ireland - Ireland’s national police force has arrested two men in connection with an audacious robbery last week on the landmark Guinness Brewery in Dublin — but said Thursday they were still looking others involved in the beer banditry. 8-year history of the brewery. Police are searching for two men who ran off after crashing a hijacked beer lorry in west London. The lorry was stolen in Bridge Road, Southall, at 1150 GMT and the vehicle then jack-knifed minutes later on Merrick Road. A Metropolitan Police spokesperson said the lorry driver got out of the cab when two men flagged down the lorry or crashed into it. The suspected thieves then lost control of the vehicle at a roundabout. Jags Khokhan, assistant sales manager at a Honda garage near the crash site, said the lorry overturned. 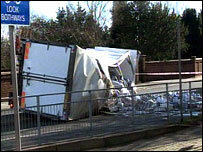 He said: "A large lorry came towards the roundabout and as it started turning it lost control and toppled over. A guy jumped out of the lorry and ran down the road. "The owner of the van came down [the road] and said the driver had been held up at gunpoint." The police spokesperson said: "There are early reports of a gun being seen, but it is not clear at this point exactly what happened in Bridge Street." The driver was said to be "very shocked" by the incident, but uninjured. So there you have it! Even though a good pint here in the US will cost me up to $5, I still prefer to drink my beer the old fashioned way! I Earn it! Well, at least I pay for it. Most stupid hangovers last a day. It will probably last years for these chaps (there are way to many prison jokes that deal with sucking down pints and blowing the head off your mug to mention on a family web site). We are sovereign rulers of our own liver, however, we must never forget that there are consequences for our actions. But, it does make for a great story.